This PDF 1.3 document has been generated by Word / Mac OS X 10.12.5 Quartz PDFContext, and has been sent on pdf-archive.com on 16/08/2017 at 02:08, from IP address 96.23.x.x. The current document download page has been viewed 97 times. File size: 5.5 MB (44 pages). programs and services, including adult tutoring. a free training workshop hosted by the organization. with a handbook to use as a reference and tool. based on our findings, as well as an evaluation strategy. 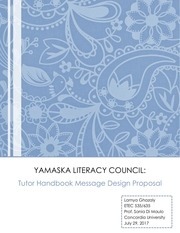 handbook in the context of the redesigned tutor training workshop. This file has been shared by a user of PDF Archive. Document ID: 00647703.